The Functional Service Provision Model (FSP) provides a scalable team of resources to meet immediate or longer-term resourcing needs through on-site or remote full time employees (FTEs). CROS NT has developed a 5-point FSP Model focused on Sustainable Quality. It is a unique offering in the sector and one of the only models that combines operational excellence coupled with a human resources element to deliver only the most qualified and best-fit resources. Pricing models that are flexible to company needs but do not fluctuate unexpectedly. 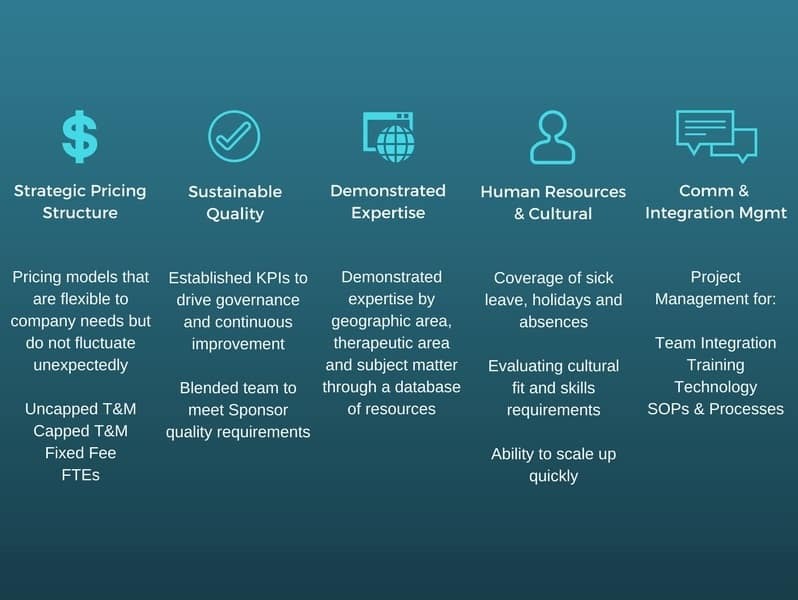 Established KPIs to drive governance and continuous improvement. Blended team to meet Sponsor quality requirements. Expertise by geography, therapeutic and subject matter area. Coverage of sick leave, holidays and absences. Evaluating cultural fit and skills requirements. Ability to scale up quickly. We have designed a “Next Generation FSP” or “FSP 2.0” to specifically address gaps in the traditional model. It lowers staff turnover by meeting the needs of the FSP team members. The Micro FSP is an ideal solution for small to mid-size pharmaceutical, biotechnology and medical device companies who may simply need a single resource or a small team of resources, ideally less than 10.